Krill oil supplement naturally rich in omega-3 (EPA and DHA), antioxidants and phospholipids. Krill oil benefits include helping to prevent cardiovascular and auto-immune diseases. Krill is the generic name for the tiny shrimp-like crustaceans found in the cold waters of the Antarctic. They are essentially composed of long-chain omega-3 fatty acids, such as EPA or DHA, the multi-potent benefits of which are constantly being demonstrated. ¤ Krill means ‘whale food’ in Norwegian, although they are also eaten by penguins, seals, seabirds and salmon. ¤ Antarctic krill oil, Euphasia superba, is extracted from frozen, crushed krill. The lipid extract is filtered to remove proteins and other components resulting in a perfectly pure oil, free from dioxins, heavy metals and PCBs. Our krill comes from Norway (AKER) and is guaranteed free from pollutant residues. What is krill oil supplement composed of? 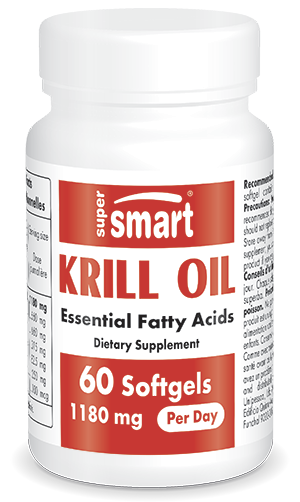 ¤ Krill oil supplement essentially consists of the polyunsaturated fatty acids EPA and DHA. One gram of krill oil provides around 250mg of EPA + DHA, and thus helps meet international nutritional recommendations for these two long-chain fatty acids, of around 500mg/day. ¤ However, what distinguishes krill oil from fish oils is its high antioxidant and phospholipid content. These compounds increase the oil’s stability, maintain the integrity of the fragile fatty acids and improve their bioavailability. Indeed, phospholipids (there are at least 40% in krill oil) uniquely ensure the transport of fatty acids to their target destinations, the cell membranes, and offer essential protection for neuron cells. ¤ The ORAC value of krill oil is 378 units per gram, which is approximately the same as for kiwi fruit. The main antioxidant in krill oil is astaxanthin (0.8mg/g), a compound belonging to the carotenoid family. Astaxanthin is a key antioxidant for eye and skin health, both of which are exposed to the sun’s UV rays. It is also widely recommended for eye fatigue and AMD as it increases blood flow in the retina and protects the tissues of the lens from free radical damage. • Chronic inflammation is at the root of the so-called diseases of civilisation: cardiovascular disease, arthritis … A number of studies have shown that krill oil reduces inflammation in the heart and vascular system. The EFSA have even recognised it as a protective substance against cardiovascular disease in their evaluations of health claims. It appears to offer benefits following a heart attack or simply in reducing cardiovascular risk linked to chronic inflammation. • Chronic inflammation also has a direct impact on the joints, particularly on arthritis and rheumatoid arthritis symptoms. Research shows that taking krill oil for a month reduced by 30% levels of C-reactive protein (CRP), a physiological marker for inflammatory processes. A few weeks’ supplementation with krill oil mitigates pain and stiffness in arthritic joints and thus reduces requirements for anti-inflammatories. • Research has shown that krill oil suppressed hepatic steatosis (fatty liver) in high-fat fed rats. In addition, other studies have shown that three months’ supplementation, at doses of 2g to 3g/day, significantly reduced LDL-cholesterol levels (by 18%) and blood triglycerides (by 27%). These results clearly demonstrate the benefits of krill oil in preventing body fat accumulation and in reducing the risk of relapse and mortality following a heart attack. • Researchers have recommended krill oil for treating certain psychological disorders (depression, bipolar disorders…). Emotional health benefits are related to krill oil’s phospholipids which enable omega-3 to cross the central nervous system easily. However, the results of larger-scale studies are awaited to expand and confirm these findings. Adults. Take one Softgel twice a day. Each Softgel contains 590mg Krill oil, Euphausia superba. For maximum efficacy, krill oil Softgel should be taken with lunch and/or dinner, either one or two Softgel a day. As with any fish oils, krill oil should be used with caution by those on anticoagulants.. Attention : contains shellfish derivatives.